This weekend, the Bernadottes marked the centenary of one of their most beloved members: the late Princess Lilian, Duchess of Halland. The anniversary was marked with an exhibition of her clothing, including some of the lovely gowns she wore for Swedish royal events. Let's have a look at some of the jewels she wore with those beautiful dresses, shall we? I've identified some of the pieces for you -- feel free to play jewel detective with the rest! We've talked quite a lot this month about Norwegian royal jewels, but so far we haven't discussed one of my favorite pieces: the Vasa Tiara, a petite diamond tiara with a larger historical legacy. You can also browse The Tiarapedia alphabetically, by jeweler, or by country! 10. Crown Princess Victoria of Sweden wore a delicate necklace, earrings, and bracelets with a silver watch at the Climate Pilgrimage on August 22. 9. Joining Victoria at the Climate Pilgrimage was Crown Princess Mette-Marit of Norway, who wore a gold pendant necklace and colorful bracelets. 8. 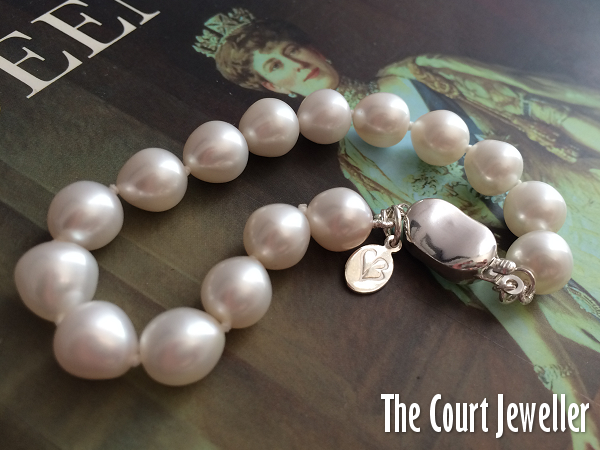 During the VJ Day anniversary celebrations on August 15, the Countess of Wessex wore her trendy pearl earrings from Heavenly Necklaces, with a large pearl affixed to the back of a smaller stud. 7. Here's how you know that the back-to-front pearl earrings are definitely on trend: Queen Rania of Jordan wore a marbleized pair at a university conference in France on August 26. 6. Empress Michiko of Japan wore a pair of interesting earrings and a simple pendant necklace to travel to a medical checkup in Tokyo on August 9. 5. Four days earlier, Michiko wore a simpler pair of earrings with a pearl necklace at the Florence Nightingale awards ceremony. 4. Crown Princess Victoria wore a rather "sharp" pair of earrings with a coordinating bracelet at the Radio Sweden anniversary celebrations on August 21. 3. Queen Maxima selected a lovely pair of earrings with a pale pink pendant drop at the opening of Papageno House on August 26. 2. The Duchess of Cornwall wore some of her favorite pieces of jewelry -- her pearl and diamond earrings, plus her pearl necklace with the round diamond clasp -- at the VJ Day anniversary celebrations on August 15. The imperial crown jewels of Russia -- diamonds as big as walnuts, rubies, emeralds, bright, blooded, or vivid green, large as a pigeon's egg; pearls like nuts set in row after perfectly matched row -- platinum, gold, and flashing diamonds shimmering like running water with the rainbow colors of a fountain in the sunlight. Over all and through all flash the diamonds, rose diamonds, black diamonds, blue, white, yellow, even greenish diamonds, thrilling and throbbing as if alive with inner flames; jewels of Golconda, jewels of Indian emperors for each of whose flashes gallons of human blood flowed like water, jewels of wars of dominion and triumph, jewels without price or equal in all the known world. These jewels have a heightened lustre and brilliance in the contrasting setting they give to the plain, drab, indifferent Bolshevistic regime with which they are now associated. Communist officials handle them with an unconcerned air and with hands that do not itch though they tremble "ever so little" over the crown of the emperor. A Russian peasant in his smock holds for the moment a sceptre that has lost all but its innate beauty and power. Workmen sit down to their lunch in the midst of this surpassing spectacle with no more avaricious wish -- even if this one comes into their thoughts -- than that those stones might be commanded to be made bread. The bride wore a lovely, sleek, simple wedding gown and adorned it with equally delicate jewels. The star of the show, jewelry-wise, was the diamond daisy bandeau given to her by her new parents-in-law, King Harald and Queen Sonja. She also wore a delicate necklace and small earrings. 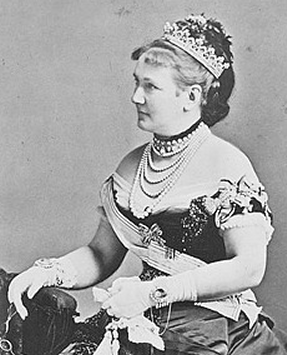 The lady of the hour was, of course, Mette-Marit, who wore two pieces of important royal jewelry: the diamond chandelier earrings that had belonged to Haakon's grandmother, Crown Princess Märtha, and Queen Maud's Vifte Tiara/Necklace, which was Maud's 18th birthday gift from her grandmother, Queen Victoria of the United Kingdom. Nothing says "I'm going to be a queen-in-waiting tomorrow" like that much family jewelry! Made by Rachel Mielke of the Canadian jewelry firm Hillberg and Berk, the brooch is made of white gold set with Madagascar tourmalines, diamonds, and a single freshwater pearl. 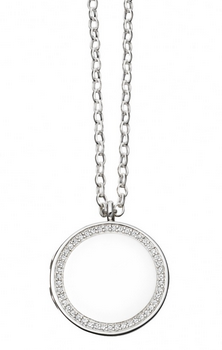 The piece has a floral design, but the geometric edges of the tourmaline "petals" give the piece a fresh, contemporary feel. Sixty years ago this October, the Portuguese president made a state visit to Britain, and a grand bejeweled evening at Covent Garden was held in his honor. Which royals can you spot? Which jewels do you see? And which royals get your vote for most glamorous? As I'm doing historical research for the blog, I'm constantly running into the stories of gorgeous tiaras that were once in royal hands but have since, for various reasons, left their owners behind. Whether they were dismantled, stolen, or sold, these lost tiaras are fascinating to me. Who wears them now? Will we ever see them in public again? Here's my list of ten of the most interesting lost tiaras -- feel free to add your own list in the comments below! It may not look like much, but the small diamond and pearl tiara that was once worn by Princess Christina of Sweden had a major royal pedigree. The tiara once belonged to Christina's great-great-grandmother, Queen Sofia of Sweden. 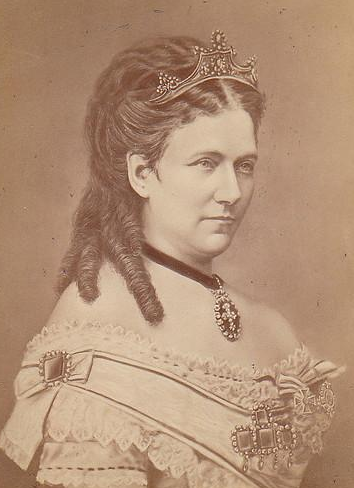 She probably left the tiara to her second son, Prince Oscar, who had to give up his title to marry one of the royal ladies-in-waiting, Ebba Munck. Oscar and Ebba's third daughter, Elsa Cedergren, was Princess Christina's godmother; she gave Christina the tiara. But sadly, the piece was stolen from Christina's home in 2012. The thief threw the tiara from a bridge in Stockholm, and although divers searched for it, it was never recovered. 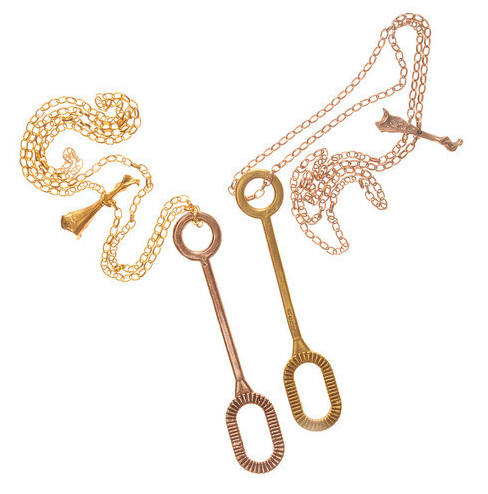 Talk about delightful: the Bubbles Necklace (£300) by Claire English is available in yellow or rose gold finishes, is fully functional, and comes with a bottle of bubble solution! Happy birthday to our Magpie of the Month, Crown Princess Mette-Marit of Norway! To celebrate, we're taking a look at every tiara that M-M has worn in public since she married Norway's hunky Crown Prince Haakon. Which sparklers are your favorite, and which Norwegian pieces do you hope Mette-Marit will debut next? This petite fan-shaped diamond necklace/tiara (the word vifte means "fan" in Norwegian) was Queen Maud's eighteenth-birthday present from her grandmother, Queen Victoria. (The eighteenth-birthday gift tiara has become a tradition in Scandinavia -- see more over here!) Mette-Marit wore the tiny tiara as a necklace for the first time at her pre-wedding gala in 2001. 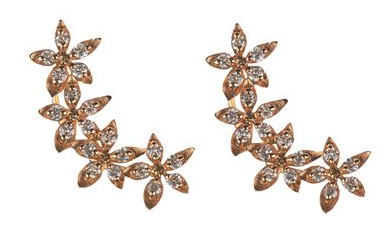 Her diamond chandelier earrings, also Norwegian heirlooms, coordinate nicely with the piece. What could I feature as today's Daily Jewel but the StyleRocks Willow Ring? 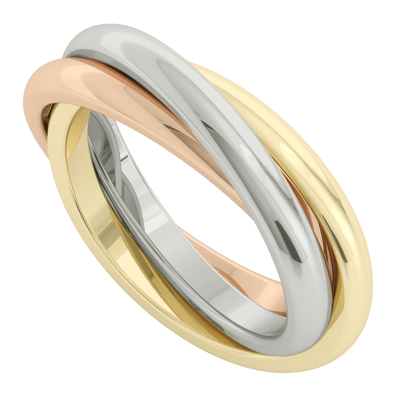 You can enter for a chance to win this traditional rolling Russian wedding ring, which can be customized in a variety of different gold finishes, until the end of our giveaway tonight! 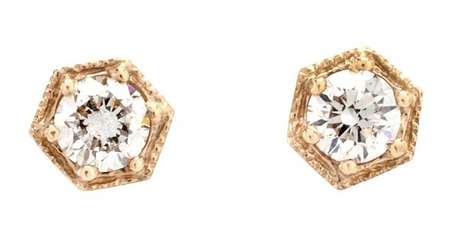 Our StyleRocks giveaway ends tonight -- enter for a chance to win a Willow Ring! 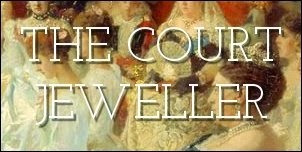 Image © The Court Jeweller. Do not reproduce without permission. 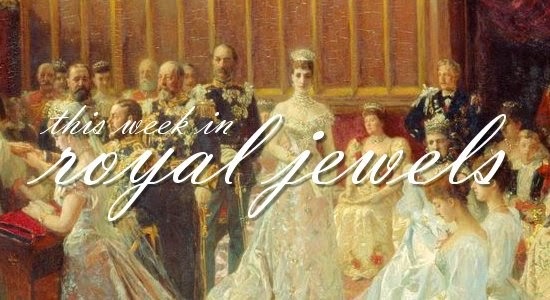 Since August is one of our traditional "slow" months for royal content, I thought I'd open my own jewelry box today and offer a review of a piece for all of you. If you enjoy the review, let me know in the comments below, and I'll consider making it a regular part of the blog rotation! 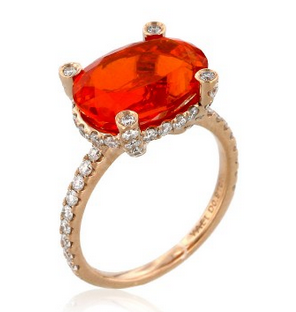 Enter for a chance to win a StyleRocks Willow Ring! 1962: Queen Juliana and Prince Bernhard of the Netherlands celebrate their 25th wedding anniversary, and there's a veritable treasure trove of royal jewelry on display. Which pieces can you spot? Our StyleRocks giveaway ends Tuesday -- enter for a chance to win a Willow Ring! As we slowly work our way through the Queen's massive jewel collection, it's time to talk about one of my favorite pieces from her jewelry box: the King Khalid Necklace. 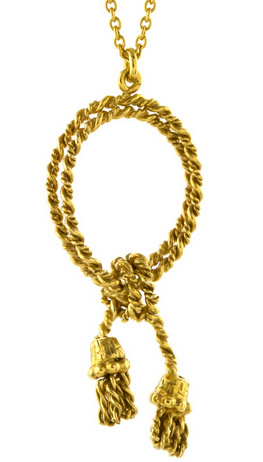 Like another piece we've previously discussed, the King Faisal Necklace, this one was also a gift from a Saudi king. As the name suggests, the giver was King Khalid, who reigned from Faisal's death in 1975 to his own death in 1982. 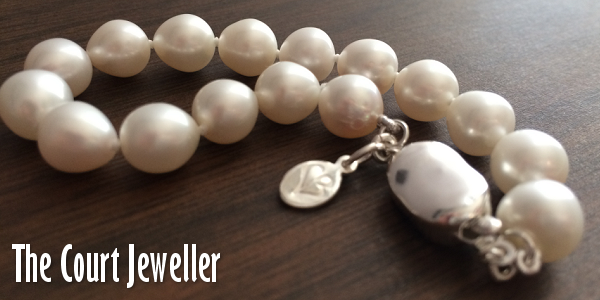 Khalid gave the necklace to the Queen in 1979, when she made a state visit to Saudi Arabia. In February 1982, the Queen wore the Khalid necklace to the premiere of the film Absence of Malice, though the necklace was slightly obscured by a rather '80s bow at the neckline of her dress. If you’re searching for a versatile tiara, look no further than the set of rubies owned by Queen Sofía of Spain. This tiara has been worn in two forms: with one strand of rubies and diamonds set in gold and placed on a frame, as well as with two strands stacked to form a more substantial diadem. The rubies, made by Van Cleef and Arpels, were given as a wedding gift to Sofía in 1962 by Stavros Niarchos, the famous Greek shipping magnate. (Sofía was born Princess Sophia of Greece and Denmark.) 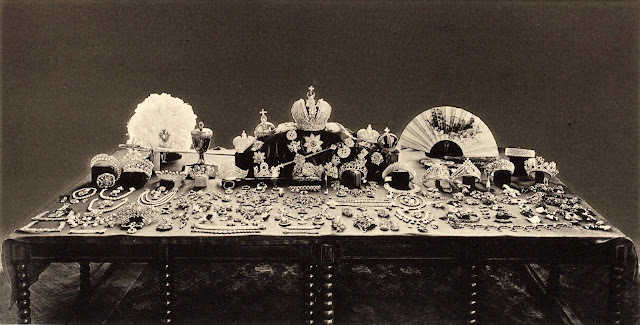 The ruby set was part of a treasure trove of wedding gifts, which also included the Prussian Tiara (from her parents), the Mellerio Shell Tiara (from her new in-laws), and the Spanish Floral Tiara (from Franco). You can read more about all of the tiaras from the Spanish collection over here. 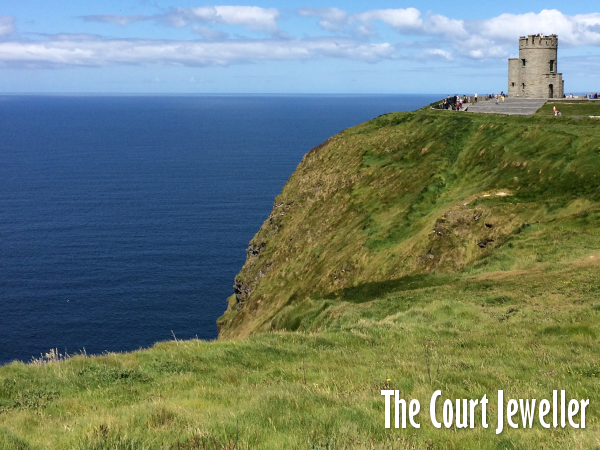 When I visited the Emerald Isle for the first time this June, much of my time was spent frolicking about the country's gorgeous landscapes -- including the famous Cliffs of Moher, pictured above. (Yes, the sky really was that blue the entire time I was there!) But, being me, I also had to take a bit of time to scout out some of the centuries-old jewelry on the island. First stop was today's featured location: the Decorative Arts and History branch of the National Museum of Ireland in Dublin. 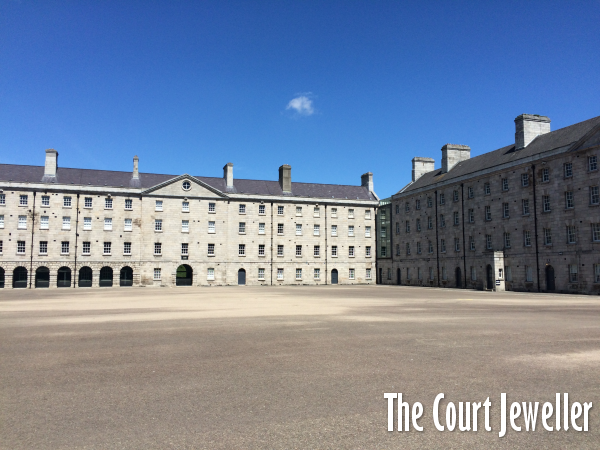 The museum is housed in Collins Barracks, which was previously a garrison housing first British and then Irish troops. Because the museum covers both decorative arts and history, there's a wide range of content inside, from exhibits on the Easter Rising to rooms full of silver and retrospectives on Irish fashion. 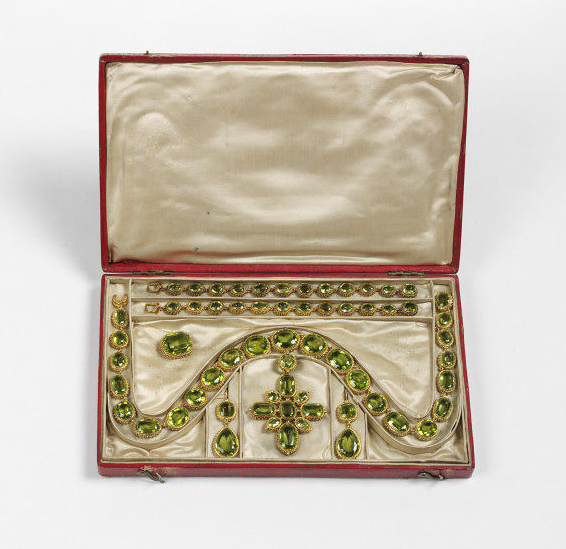 Tucked away in a room on one of the upper floors you'll also find several cases full of antique jewelry. Here are some of my favorite pieces on display, including some with royal connections!